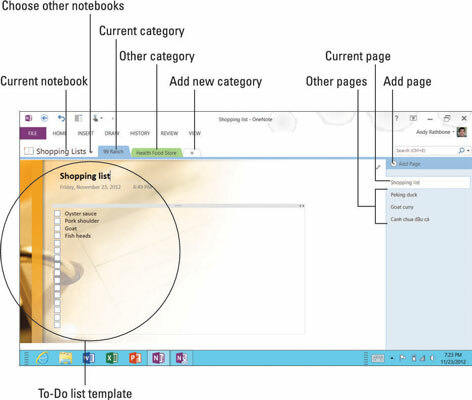 A computerized three-ring tabbed binder, Microsoft’s OneNote organizes your notes. It’s not picky, letting you add notes in any form: typed by hand, copied from websites, recorded as audio, captured as a photograph or video, or even handwritten with a stylus on the tablet’s screen. Students have embraced OneNote because it lets them open a Chemistry section, create a new tab for each new lecture or subject, and fill it with freeform notes, including photos of the blackboard or hand-written equations. Notebooks: Everything starts with a notebook, which holds all of your notes. You can create as many notebooks as you wish, each designed around its own theme. OneNote starts with two notebooks: The Personal notebook contains notes dealing with you and your home; the Work notebook helps you track your work-related projects. Categories: Each notebook can have several categories to separate your projects. The Home notebook can have a Remodeling category, for example, as well as a Shopping List category. Pages: Here’s where you break down your categories even further. The Home notebook’s Recipe category can have a page for each recipe. Open OneNote, tap File from the top menu and tap New. To create a new notebook, begin by choosing a storage location, usually SkyDrive, so it can be accessed from any of your computers. Then type a name for your Notebook, in this case, Shopping List. Choose whether to share your notebook with others. When the Microsoft OneNote window appears, you can tap the Invite People button to give others access to your OneNote file. That’s handy when creating projects at work, for example, or creating a shopping list that can be on every family member’s phone. To keep it private, tap the Not Now button; you can always share it later. Type notes into your project, adding Categories and Pages as needed. OneNote appears, letting you add Categories and pages to organize your notes. If you want, save time by starting from a template: Tap Insert from the top menu, choose Page Templates from the drop-down menu, and choose from the templates offered on the screen’s right edge. To add a category tab, tap the plus sign to the right of the last tab and then type the category’s name. The figure offers two categories, for example: one for 99 Ranch Supermarket, the other for a local health food store. Each category contains a shopping list for a different store. To change or delete a tabbed category, rest your finger on its tab until the pop-up menu appears, and then choose your option. To add a page to the currently viewed category, tap the words Add Page atop the right column and type in a page name. For example, the 99 Ranch category lists some recipes for favorite dishes, making it easy to look over the ingredient list while at the store. When you’re through taking notes, simply stop and close the program with a tap on the X in its upper-right corner. The program automatically saves your work with the name and location you chose in Step 1. Microsoft offers OneNote for PCs, Apple computers, and every smartphone, letting access your notes from nearly any location.